Kelley proved right on the first tee that not only is he one of the country’s best sports columnists, but also a complete sandbagger with his golf game. He belted his drive down the right side of the fairway. OK, so it took him another five shots to get down from 135 yards on the first hole. I told him we just wouldn’t talk about that part. Kelley may not have had much time to play golf, but he does now. He retired from The Seattle Times in February, having been one of the best sports columnists for more than 30 years. He tried to keep his clubs close, even in the trunk of his car most of the time. But covering sports, writing four times a week and trying to think of the next column, Kelley just didn’t have the time he would have liked to play golf. He does now. But he had a strange way of showing it. He did mention that when he found out he was hitting the golf course for a story about the life and times of Steve Kelley, he couldn’t find his clubs. They weren’t in the trunk of his car. Not in a hall closet. Not in the garage. He had to call his wife Carole the morning of the round to find out where they were. “Turns out they were at the back of a closet – she put them there,” Kelley said. That won’t be a problem any more. Kelley plans to play golf in his retirement. Lots of golf. In fact, when we played many years ago, Kelley still had old-school equipment. Wood woods. Old-school irons. And even older-school putter. Now he carries new Callaway irons, Titleist woods and even a hybrid “but I can’t hit it yet,” he said. Kelley has always loved golf. He has covered the Masters four times and a PGA Championship. He went to the U.S. Open at Merion Country Club (the site of this year’s tournament) in 1971 and fell in love with the game when he saw Lee Trevino beat Jack Nicklaus in a playoff. Kelley has covered all the big-time events. Super Bowls. NBA Finals. All-Star games. He even covered nine Olympic Games, four summer and five winter. His personal highlights: Usain Bolt and Michael Johnson, the Jamaican and U.S. sprinters who won Gold Medals. Kelley worked at the Seattle Times for 30 years. His former boss sports editor Don Shelton had a cool spin on Kelley’s retirement by the numbers. Kelley wrote 3,446 columns for the Seattle Times, had 5,882 total bylines and was named national sports writer of the year five times. Kelley also had some interesting alter egos in his time, writing under the name of Jim Ratt (a Sonics fan), Ducky Ponds (a Mariners fan) and Red Dogg (a Seahawks fan). If you’ve ready Kelley through the years, you no doubt know those guys too. Kelley has written about virtually everything dealing with sports. And that goes all the way back to his days when he worked for the Centralia Daily Chronicle in 1973. And just for some interesting job bio stuff, Kelley worked as a repairman for Sears at one time and also a forklift driver in Chelan. But it was the newspaper business where he made his mark. If you are a sports fan you know who Steve Kelley is. You might not agree with him, but you read him. Kelley finally convinced himself it was time to hang up the pencil and notepad when social media began to rear its ugly head. When his columns appeared on the Seattle Times website, Kelley didn’t always like the comments he read underneath. Sure, he has thick skin. But some of the comments were downright nasty and mean. And now, he has time for more golf. He said he would like to get back to the time when he was shooting in the high 80’s when he worked at the Daily Olympian 35 years ago. When he was working full time and writing four columns a week, he would have had no chance. Now, with retirement life here, he has a chance. During this round at Twin Lakes, Kelley proved there are some shots in his bag that he can pull out. He one-putted a few greens, hit some fairways off the tee and got up and down twice. Not bad. But he also topped a couple of shots, sculled a few, fired some drives into the trees and had some three-putts. OK, bad. 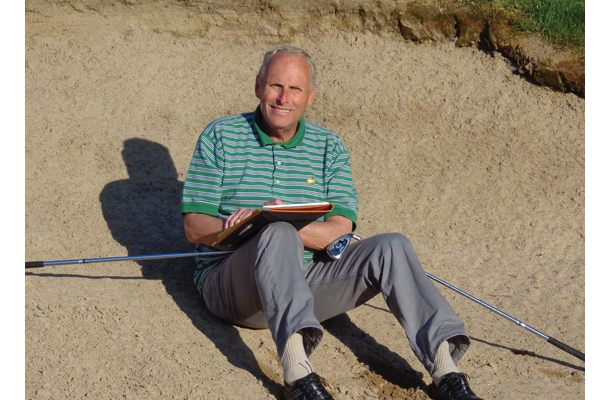 Kelley wrote a series of stories last year, taking some lessons from TPC Snoqualmie’s Luke Borsterhous and called it his “Senior Project.” He found himself getting better. But lessons came at a bad time, just when football was getting into high gear. The clubs got put away, and the notepad, pencil and laptop came back out. He might not be the best on the course right now, but as a sports columnist, Kelley was always one of the best.